A healthy diet is balanced by the three macronutrients: protein, fat, and carbohydrates. All are essential sources of energy and micronutrients to help our bodies perform at their peak. Like protein and fat, not all choices are created equal when it comes to carbohydrates. A diet high in simple carbohydrates, carbs that are quickly converted to energy, can result in excess energy and result in unfavorable biomarker levels and health outcomes like metabolic diseases, diabetes, and high triglycerides. Simple carbohydrates are found in most processed foods, candies, and sugar-sweetened beverages. However, some natural foods such as fruit also have simple carbohydrates. On the contrary, diets high in complex carbohydrates, those that require quite a bit of digestion to be released as energy, are highly associated with favorable health outcomes, including decreased incidence of cardiovascular disease and diabetes.1 These carbohydrates provide long lasting energy, aid in digestion, and improve metabolism by reducing fasting blood glucose and lowering cholesterol. Beans, whole grains, and vegetables are excellent sources of complex carbohydrates. 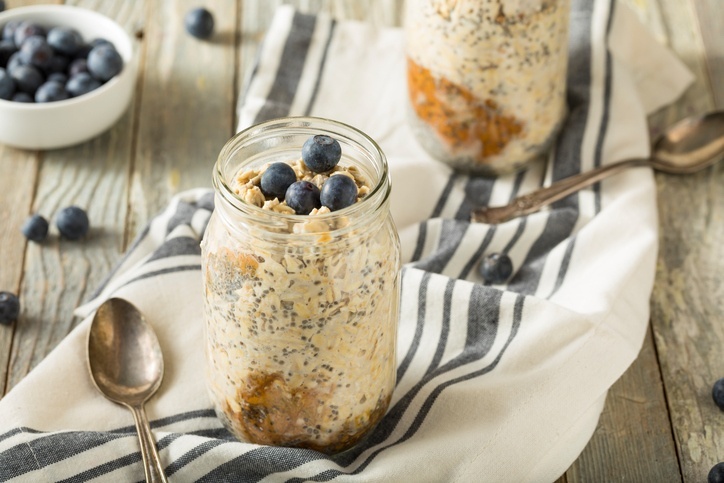 Aside from the vitamins and minerals found in whole grains, fiber is the nutrient that makes complex carbohydrates so beneficial for improving overall health. Whole grains are high in one form of fiber in particular, soluble fiber. Soluble fiber is named for its ability to absorb water and swell in the GI tract. As soluble fiber moves throughout the body after we eat it, it slows the absorption of the simple sugars that were also included in the meal. Simple sugars eaten alone are rapidly absorbed into the blood stream causing a spike in blood glucose levels. When consumed without a need for immediate energy (like before going to bed or sitting at a desk), the pancreas is tasked with excreting enough insulin to bring blood glucose levels back down to normal. This results in a series of peaks and valleys in blood glucose levels throughout the day. Overtime, the pancreas becomes less and less effective at reducing fasting blood glucose levels—especially if it is regularly required to due to a high intake of simple sugars. A diet high in soluble fiber helps to reduce the peaks and valleys of blood glucose because it slows the digestion of simple carbohydrates and slowly releases energy from other carbohydrates. This results in lower overall peaks in blood glucose, which in turn means less strain is placed on the pancreas to bring those levels back down. Translation: limiting the workload on your pancreas throughout your lifespan will decrease the likelihood that as you reach old age, your pancreas will be "worn out," leaving you at an increased risk of developing diabetes. So what's the moral of the story? Start your mornings off with a bowl of oatmeal each morning in your younger years (or tomorrow) to avoid disaster (diabetes) down the line. McKeown NM, Meigs JB, Liu S, Wilson PW, Jacques PF. Whole-grain intake is favorably associated with metabolic risk factors for type 2 diabetes and cardiovascular disease in the Framingham Offspring Study. The American Journal of Clinical Nutrition. 2002; 76:390-398. Micha, Renata, et al. "Association between dietary factors and mortality from heart disease, stroke, and type 2 diabetes in the United States." Jama 317.9 (2017): 912-924. Hagander, Barbro, et al. "Dietary fiber decreases fasting blood glucose levels and plasma LDL concentration in noninsulin-dependent diabetes mellitus patients." The American journal of clinical nutrition 47.5 (1988): 852-858. Wang, Qi, and Peter R. Ellis. "Oat β-glucan: physico-chemical characteristics in relation to its blood-glucose and cholesterol-lowering properties." British Journal of Nutrition 112.S2 (2014): S4-S13.